A towering prominence spawning tree-like branches dominated the northern limb of the Sun today. Different exposures were made and combined to try to accommodate the huge range of brightness in the structure. AR1059 near the centre of the Sun's disk has not grown and AR1057 now close to the limb is decaying. An unexpected clear spell between the clouds allowed an attempt at imaging Saturn. Today I completed the protective cap for the front of the scope and took the completed scope to the Fairwood observatory. Hopefully this scope will be used by observers not wishing to open up the dome and use the full aperture solar filter for the LX200 SCT. I modified a 70mm F/700 refractor by fitting a Thousand Oaks black polymer solar filter permanently in front of the objective lens (to remove the filter, two screws have to be removed, so there is no danger of the filter falling off during an observing session). An ideal eyepiece focal length is 20mm-25mm giving a view of the full disk. I have included a 20mm eyepiece with the scope. I have fitted the scope with a solar finder for the rapid and safe acquisition of the Sun. This scope is ideal for fitting on the EQ3-2 mount at Fairwood. In between clouds today I was able to test the scope visually and two ways photographically. 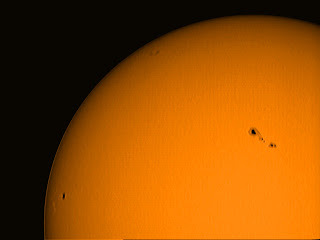 Fortunately there was a large sunspot group AR1057 and a small sunspot AR1059 on the Sun. Clouds interfered but the test was a success and shows that members can record sunspots with a suitable compact camera. Then I placed a DMK USB2.0 camera at the prime focus and stacked the best 2000 frames of AR1057. 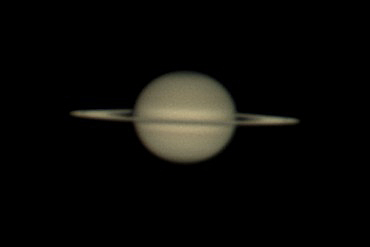 The frames were stacked in Registax4 to produce the final image. Visually the scope shows the Sun as a pleasant yellow.